Richard Greenwood and Todd Engelman, et. al. 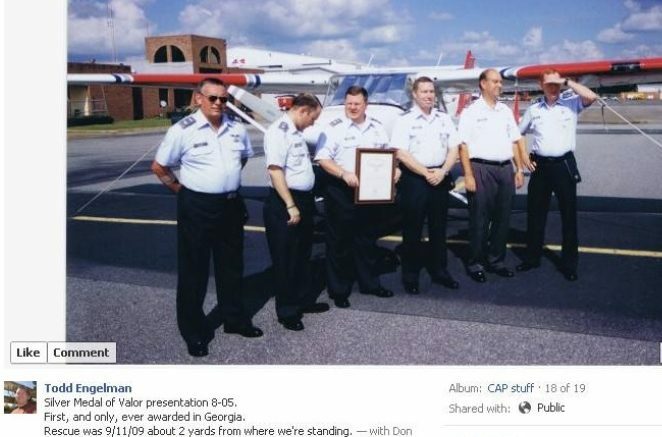 receive CAP Silver Medal of Valor at Middle Georgia Regional Airport. The following citations appeared on page 19 of the September 2005 issue of Civil Air Patrol News regarding an incident that these members reported to have occurred on 11 September 2004 at Middle Georgia Regional Airport. Lieutenant Colonel Richard J. Greenwood, CAP, distinguished himself by conspicuous, heroic action by risking his own life to save another on 11 September 2004. After successfully completing a search for a distress signal, Colonel Greenwood was debriefing with the other air and ground team members at the Middle Georgia Composite Squadron building. Colonel Greenwood and another CAP member were heading back toward the flight line, when they noticed that a Learjet taxiing to the ramp was on fire, and he yelled for help. The plane had blown its left main tires on landing, parts of which ignited against the glowing hot brake disks as they taxied. The crew and passengers were unaware of the fire. Colonel Greenwood and the other member quickly opened the flight line gate, as others ran to the trailer to retrieve two fire extinguishers, and next door to the fire department for help. Colonel Greenwood and the others sprinted toward the plane about 100 yards away. At this point the flames from the left gear erupted as the brake line burned through, spraying hydraulic fluid into the fire. The flames engulfed the gear and spread several feet in each direction along the wing and fuselage, reaching the belly fuel tank vents, as the engines were being shut down. Colonel Greenwood and the others squatted under the wing by the gear and temporarily putting out the flames. When Colonel Greenwood ran to open the upper door two passengers leapt out over the still closed lower door to escape the aircraft. Another member and Colonel Greenwood opened the lower door and helped the third passenger and two aircrew members escape. The blaze reignited and was doused again. The occupants were moved to a safe area and the members continued to watch the aircraft to ensure the flames did not reignite until the Macon airport fire department arrived about four minutes after the crew and aircraft were secure. Lieutenant Colonel Greenwood’s quick thinking, heroic action and willingness to risk his own life to save others, reflects great credit upon himself, the Southeast Region and Civil Air Patrol. Lieutenant Colonel Todd A. Engelman, CAP, distinguished himself by conspicuous, heroic action by risking his own life to save another on 11 September 2004. After successfully completing a search for a distress signal, Colonel Engelman was debriefing with the other air and ground team members at the Middle Georgia Composite Squadron building. Colonel Engelman and another cap member heard the cry for help with an aircraft fire and quickly responded. door to the fire department for help. The plane had blown its left main tires on landing, parts of which ignited against the glowing hot brake disks as they taxied. The crew and passengers were unaware of the fire. Colonel Greenwood and the other member quickly opened the flight line gate, as others ran to the trailer to retrieve two fire extinguishers, and next door to the fire department for help. Colonel Engelman and the others sprinted toward the plane about 100 yards away. At this point the flames from the left gear erupted as the brake line burned through, spraying hydraulic fluid into the fire. The flames engulfed the gear and spread several feet in each direction along the wing and fuselage, reaching the belly fuel tank vents, as the engines were being shut down. Colonel Engelman and the others squatted under the wing by the gear and temporarily put out the flames. While other members ran to open the door and quickly assist the passengers out of the aircraft, Colonel Engelman and another member continued to observe the aircraft. The blaze reignited and was doused again. The occupants were moved to a safe area and the members continued to watch the aircraft to ensure the flames did not reignite until the Macon Airport Fire Department arrived about four minutes after the crew and aircraft were secure. Lieutenant Colonel Engelman’s quick thinking, heroic action and willingness to risk his own life to save others, reflects great credit upon himself, the Georgia Wing and Civil Air Patrol. Be the first to comment on "Engelman-Greenwood Silver Medal of Valor"
I think we are done here. Click.